As this is my penultimate Counterpoint column, it’s time to give Prime Minister Shinzo Abe a report card for his nearly five years in office. Overall, I give him a D+ because he has not been a total failure and he shows up for work. But he also has not delivered on most of his promises and pledges, and, as I’ve detailed in previous columns, has been a disaster on transparency, governance, “womenomics,” hatemongering, immigration, press freedom, nuclear energy and historical issues. For most sentient beings in Japan, Abenomics is a bust. 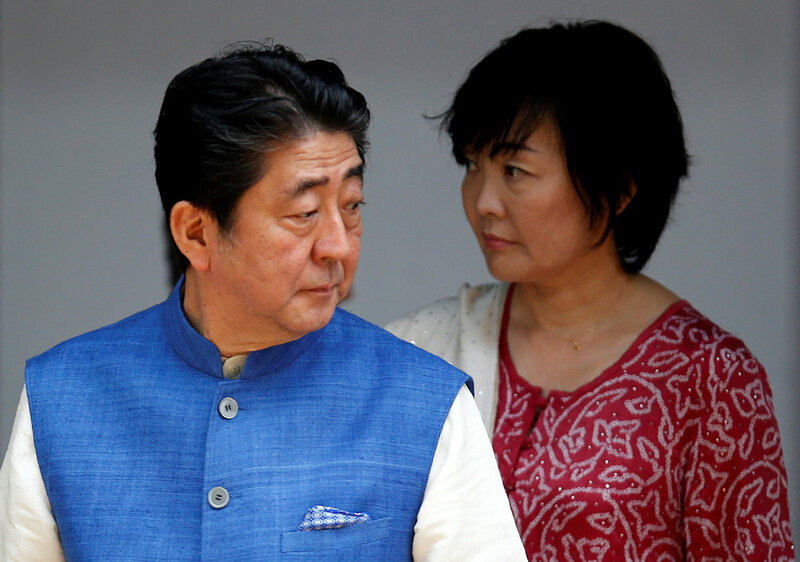 There are many good reasons why 83 percent of the public doesn’t trust Abe, and even his crack team of spin doctors is finding it harder and harder to bamboozle the Japanese about the empty suit parading as a leader. Abe’s stealthy revision of the Constitution by reinterpretation adds perspective to Finance Minister Taro Aso’s praise for how the Nazis furtively revised theirs in the 1930s. Retaining Aso after two pro-Nazi gaffes — most recently giving a shout-out to Adolf Hitler for his good intentions — is despicable. Standing by Defense Minister Tomomi Inada way after it was obvious she had to go and protecting her from Diet scrutiny for her role in a cover-up is also inexcusable. It is equally striking that for a leader who has faced a weak, divided opposition and has enjoyed a commanding majority in both houses of the Diet, Abe has accomplished astonishingly little on many of the key challenges facing Japan. Abe, Japan’s most ideological post-World War II premier, has instead spent considerable energy on rewriting history and trying to revise the Constitution. He hides behind Abenomics, but overturning the postwar order is what gets him and his base fired up. Abenomics gets a gentleman’s C-. It has been a wonderful branding strategy, helping reboot Abe’s political career after he self-destructed in 2007, but he has not delivered on what was promised, and promised again and again. Deflation persists, wages are stagnant, bonuses actually fell this past year, households are not feeling the love and nonregular jobs remain at a historic high despite a tight labor market. The nearly 10 million working poor — those earning less than ¥2 million a year — weigh down consumption and thus fuel deflation. Abe’s advisers believed that deflation was a primarily a psychological problem that could be rectified by convincing consumers that prices would rise so they’d better buy now, but the real problem is low disposable income for too many people with thin wallets. Firms’ profits have soared, helped considerably by the devaluation of the yen caused by massive quantitative easing, but their reluctance to raise wages or shift nonregular employees into full-time jobs suggest that corporate Japan is wary about the sustainability of Abenomics. Why shouldn’t it be, given that Bank of Japan Gov. Haruhiko Kuroda recently said as much? Hedge fund managers crow about Abenomics because it has boosted share values by rigging the stock market — pumped up by massive buying by the Bank of Japan and mandated purchases by the national pension fund — but these gains have not trickled down to very many Japanese. 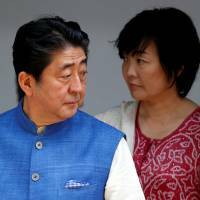 I spend a lot of time in rural Japan and ask people about the benefits of Abenomics, and the reaction is usually a rueful smile suggesting “What are you dreaming?” Abenomics boils down to “welfare for the wealthy” because it has helped those who don’t really need any while bypassing those in need. The ostensible reason for juicing the economy with the steroids of quantitative easing and fiscal stimulus was to facilitate structural reforms, but in doing so the pressure on firms to enact such reforms was reduced, and Abe has provided little leadership on promoting them. The first two arrows of monetary easing and fiscal stimulus faced no organized opposition and benefit powerful interests, but structural reforms have been vanishingly small and watered down to ensure minimal impact. This is because Abe’s Liberal Democratic Party represents the vested interests that would stand to lose from deregulation and other structural reforms. By keeping the third arrow of structural reforms in his quiver, Abe has ensured that Abenomics won’t put the economy on a sustainable growth trajectory. On the foreign policy front, I give Abe a C+, with good marks on Southeast Asia, Taiwan and Europe. Diplomatic initiatives toward the U.S., China and India have been less beneficial while his wooing of Vladimir Putin — which the Russian president has repeatedly rebuffed — has been an abject failure. Abe has met Putin more than any other leader, investing substantial political capital in pursuit of a deal on the Russian-held Northern Territories. In showing how desperate he is to cut a deal, almost any deal, Abe has boxed himself in and the Russians have taken advantage of his naive gambit. Putin has played Abe and embarrassed him. To his credit, Abe has pursued his dream despite American pressure to isolate Moscow, one of the few cases where Tokyo has defied Washington, but perhaps they cut Abe some slack because he has done more to fulfill the Pentagon’s wish list than all of his predecessors combined. He is Uncle Sam’s man in Japan, easing constitutional constraints on Japan’s armed forces, signing on to new U.S.-Japan Defense Guidelines in 2015 that commit Japan to provide military support for the U.S. anywhere in the world, including boots on the ground, and passed legislation that allows Japan to exercise the right of collective self-defense. All of this enjoys little public support but earned him kudos in the U.S.
Abe also bit the bullet on President Donald Trump, cravenly cozying up to him to curry favor and protect the alliance from an erratic and dysfunctional White House. But this has increased risks for Japan, while it’s not clear that any of these moves have made Japan safer. Does anyone really think Trump will endanger Los Angeles by retaliating for a North Korean attack on Japan? Why has Abe shied from a more vigorous regional diplomacy? It is especially damning that he recently considered a breakthrough visit to Pyongyang, but only to salvage his plummeting popularity rather than to advance any thoughtful strategic plan. This constant prioritizing of image and optics over substance is why he deserves a low grade.